The 30th Annual Paul Bunyan Mountain and Blues Festival, scheduled from 11 a.m. to 5 p.m. Saturday, July 7 at Westwood Park, has a variety of events that will entertain the entire family. Those who attend will find modern-day lumberjacks in the tradition of Paul Bunyan competing at the Logging Show; live blues bands entertaining near the food vendors under a canopy of tall pine trees; vendors offering arts, crafts, collectibles and antiques; a children’s carnival area with inflatable activities; and a junior logging show. The festival is named after Paul Bunyan, a mighty lumberjack of American folklore because of his connection to Westwood. The escapades of this character were used as an advertising strategy by the Red River Lumber Company, the mill Westwood was built around. Westwood produced many lumberjacks during the time the mill was in operation and years after it was shut down. Sponsored by the Westwood Area Chamber of Commerce, the Paul Bunyan Mountain and Blues Festival has a wide array of activities included with the price of admission making it a good choice for families looking for entertainment the week encompassing the Fourth of July. It is located at Westwood Park on south Greenwood Street. 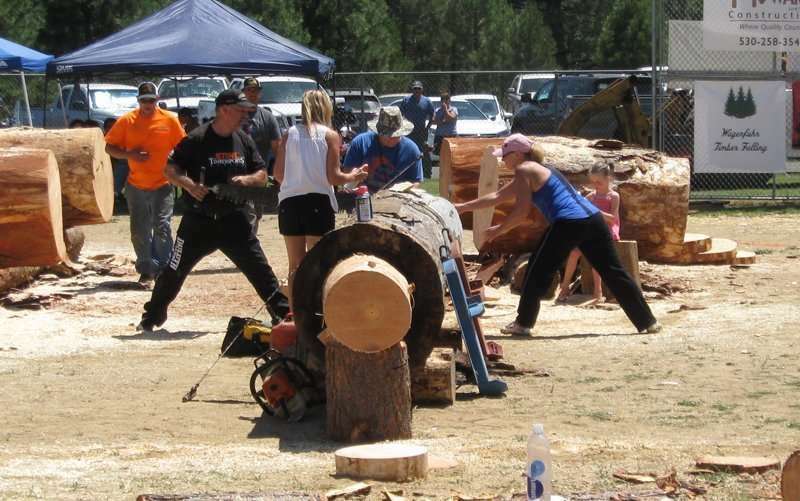 The most unusual aspect of the festival is the logging show in which contestants compete in lumberjack skills using axes and saws. 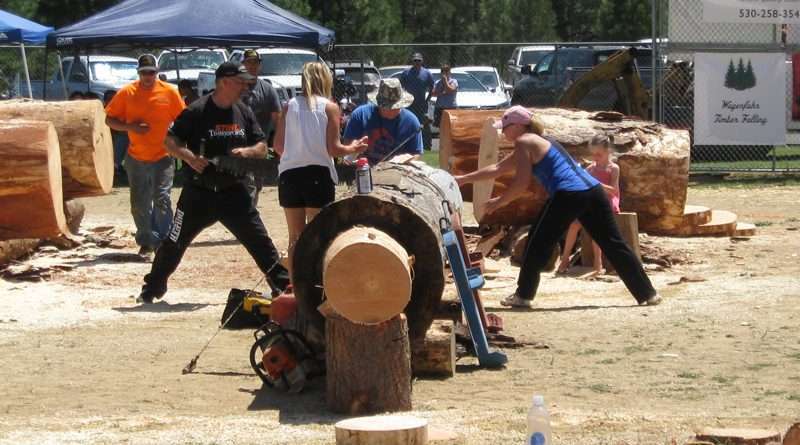 Logging show organizers, Jack Medici and Tommy Salem, expect more than 20 competitors to compete in the ax throw and chopping as well as the handsaw and chainsaw competitions. Some of the events feature old logging methods while others are techniques used by modern lumberjacks. For example, contestants are timed on how fast they can chop or saw a log. Both handsaws and chainsaws are used in the competition. Sponsors of the Logging Show are Almanor Dry Dock, Bailey’s, Collins Pine Company, DL Stoy Logging Company, Holt Enterprises, Howard Construction, John Wheeler Logging, Inc., Knotty Pine Resort and Marina, Lake Almanor Ace Hardware, Lake Almanor Brokers, Red River Forests LLC, Shasta Forests Timberlands LLC, Sierra Energy, Wagenfuhr Timber Falling and Westwood Quik Mart. Children have an opportunity to compete in Paul Bunyan activities designed for youth, such as nail driving and log rolling during the Junior Logging Show. New this year is an apple pie baking contest. Contestants bake two pies, one for the judges and one to sell. The first place winner receives a five-quart standup Kitchen Aid Mixer and the second place winner receives a $100 gift card to a kitchen utensil company. Sponsors of this event are Payless Building Supply, Sug’r Shack and Lassen True Value Hardware. A festival tradition is Blue Ox Bingo, in which squares are sold and the winner picked when a steer relieves itself while grazing on a grassy area with numbered squares. The amount won depends on how many squares are sold. Crafters will be selling their wares at booths and there will also be vendors selling antique furniture, collectables and repurposed items. There is a full arts and craft section from which to browse and make selections. Booths open at 11 a.m.
Musical entertainment is available to festival goers who can bring a blanket or lawn chair and stake out a home base on the lawn near the stage which is shaded by pine trees. This year The Amy Celeste Band and Nothin’ Personal provide the blues entertainment. Bands entertain from noon to 4:30 p.m.
For an additional cost, children can cool off on an inflatable water slide or slip and slide in the carnival area. In addition, they can play on other inflatable toys. There are two areas, one for small children and another for older kids. Fun carnival food is also sold at this venue such as cotton candy, kettle corn, Hawaiian ice and gourmet lemonade. Festival sponsors are Almanor Energy Plus, Buffalo Chips Pizza, Captain Andy’s Mountain Market, Diamond Saw Shop, Edward Jones-Carla Parsons, Ed Staub and Sons Petroleum, Inc., House of Custom Cabinets, Lassen County Federal Credit Union, McNeill Security Storage LLC, Plumas Bank, Sierra Broadcasting Corp., Turner Excavating/Round Mountain Rock, Westwood Quik Mart, W.M. Beaty and Associates, Inc.
For more information on the Paul Bunyan Mountain and Blues Festival, call the Westwood Chamber of Commerce at 256-2456 or visit the website at westwoodareachamber.net. Although gates to the Paul Bunyan Mountain and Blues Festival open at 11 a.m. Saturday, July 7 at Westwood Park, the festivities begin Friday night, July 6, with a street dance and several events take place Saturday morning. The Paul Bunyan Mountain and Blues Festival 5K Fun Run/Walk begins at 8 a.m. Saturday, July 7, starting at the Lassen County Visitor Center-Westwood Station, corner of Ash and Third streets near the railroad tracks. Registration begins at 7 a.m. Children 12 and under are free but must have a permission slip signed by a parent in order to compete. Jon and Emily Foy organize this event and donate the proceeds to Westwood youth sports and community projects. Registration forms are available at westwoodareachamber.net and can be printed in advance or participants can register online, or just come to the Lassen County Visitor Center-Westwood Station and sign up before the race starts. From 7 a.m. to 10:30 a.m., volunteers for the Westwood Museum will be serving pancakes, eggs and bacon at the Westwood Community Center at the corner of Third and Birch streets. A parade will launch the Paul Bunyan Mountain and Blues Festival at 10:30 a.m. progressing down Ash Street to Third Street and ending at Westwood Park on Greenwood Street, the site of the festival. The theme for the parade is “Hometown Hospitality.” The parade grand marshals are Susan and Steve Goodwin, owner of Westwood Quik Mart/FuelGood Gas Station. The Westwood Chamber welcomes all groups and individuals as parade participants. Kids can decorate their bicycle, clubs and groups can march or decorate a pickup truck or trailer, owners of classic cars and convertibles can drive the route and horseback riders can enter. There is no entry fee. Entry forms are available at westwoodareachamber.net. The parade lineup site is at Seventh and Ash Streets at 9:30 a.m. Saturday morning, July 7.